Trying to capture the attention of a customer in a shopping environment is a hard thing to do. Especially in the massive home-depot kind of shops our product is being displayed. This project has tackled the challenge to capture the attention of the customer, engage and inform them about the possibilities of connected lighting. Making the huge variety of products easier to digest and understand and speaking to the imagination of the customer on how to use these products in their day to day lives. 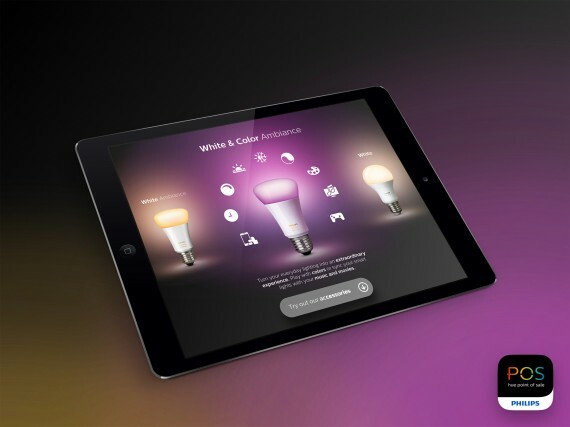 This app assists shoppers to explore the full range of Hue products and takes them on a journey to experience the possibilities of connected lighting right there and then. The app is designed and developed to be used in thousands of shops world-wide, each line of stores having their own specific needs as to how consumers go through the shopping experience. To ensure the app enables servicing all of our markets, we first collected all insights and learnings from the markets. Either by separate shopping behavioral studies or by looking at usage of consumers in the previous app. Next step was to consolidate all information into a clear requirement document for the app, set the vision for what we want to achieve and start the actual design process. By doing small design iterations and doing hi-fidelity prototyping we were able to deliver clickable and truthful examples of how we could provide the right information and controls to consumers in store. These prototypes were shared with markets whenever new versions became available. Thus, the stores could test immediately and give feedback. This allowed us to continuously refine the proposition and improve the design of the app, and ensured all requirements were taken into scope. Only when all markets reported green lights on the requirements and usability studies we started speccing out the designs to hand off to development. This process worked great for us because we found out numerous requirements we otherwise might have missed, think of stores that completely cut electricity. How do we handle auto booting of the app, bridge and lights and make sure that all scripted light effects are automatically resumed at start of the day. Or how do we handle the diversity in connected devices that varies from store to store. In the end we designed an UI that is completely modular and automatically adjusts its layout and content based on the connected devices in the Philips Hue Point of Sale. Are there color bulbs, white bulbs, accessories connected etc… this defines the UI for the tablet app. This simplifies installation and configuration since installers are not required to go through an extensive complicated configuration, also ensuring human error is taken from the process. After deploying the app to numerous markets, we have increased stopping power, engagement and purchases across the board. Furthermore, diversity of purchased devices increased while questions asked to shop personnel decreased.